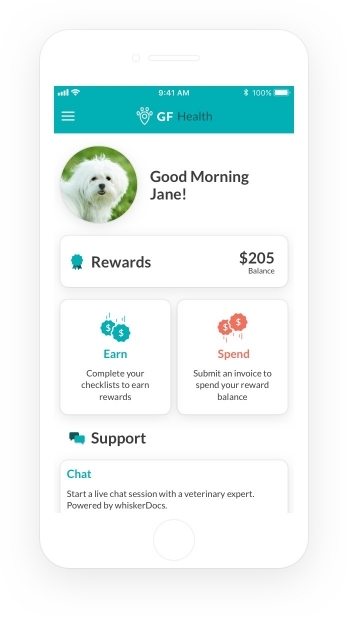 You're already a great pet parent, why not get rewarded for it? Snap a picture of your veterinary clinic invoice. Earn rewards by completing your pet's health checklist. At sign-up, each of your pets receives a tailored health checklist from your veterinarian. Better yet, we track progress with each invoice that you upload and magically update your list for you. We pay you for completing items and these cash rewards can be used on any future vet visits, for any invoice. It’s that simple. Is this normal or urgent? We have you covered with unlimited chat and call support from our vet experts. Save time, stress, and avoid unnecessary emergency fees. Members can earn over $200 each year per pet towards their care at their local veterinary practice. Here are just a few examples of how. You have access to 24/7 pet helpline and can connect to a vet and/or if you're about to google yourself scared you can also email a vet questions and get a response in 24 hrs. I highly recommend this service. I just wanted to say my boyfriend & I were a little skeptical before signing up (seemed too good to be true), but I am already super impressed with the service and user-friendliness so far! Cancel anytime with no cancellation fee! You just lose your unclaimed rewards. Can I transfer rewards between pets? You can use rewards for any of your pets. If a pet passes away we store your points for 2 years for reactivation with any new pet. Can I donate my rewards? Yes! If you think you’re not going to use your rewards, you can donate them to support vet care for pets in need. Is there a limit to vet support? There is no limit! We don’t want you up late worrying, so feel free to call or chat with our vet experts 24/7.